Born in California on March 31, 1906, Cortlandt T. Hill was recognized as a worker as well as a competitor in American skiing. He was a ski sport builder In the California Ski Association and the National Ski Association. The name of Corty Hill stands out prominently among any listing of ski sport builders who have contributed unstintingly of time and financing to the forward growth of organized competitive and recreational skiing throughout North America. 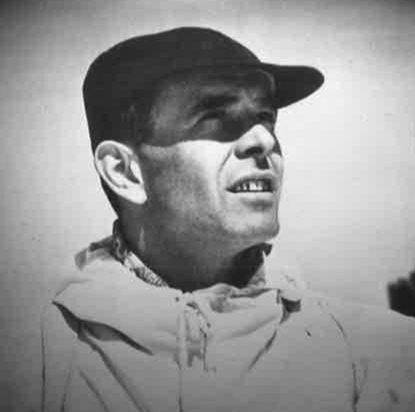 Corty Hill’s initial ski venture of import came in 1937 when he organized and sponsored the first slalom race ever held on the so-called Eastern Slope of the High Sierra. This was at McGee Creek, close by Mammoth Mountain that was then still only known to ski mountaineers. As a National Ski Patrol Section Chief during World War II, Hill was instrumental in leading a ski patrol search mission for downed aircraft in the Sierras. Late in 1945 Corty was among the CSA leadership which met in Los Angeles and tabbed Mt. Rose in Nevada as the site for the division’s 1946 alpine championships which set a high standard for the ski boom following World War II. Elected FWSA president ahead of the 1947-48 ski season, Corty Hill almost single-handedly brought the United States Olympic Ski Team to St. Moritz in Switzerland for the Winter Games during which Gretchen Fraser won the first gold medal in skiing for America; he chaired the U.S. Olympic Ski Games Committee in 1952 at Oslo, Norway where Andrea Mead Lawrence won two gold medals for the team and he was general chairman of the American Team for the F.I.S. Alpine world Championships at Aspen, Colorado in 1950, the first ever held in the United States. Hill also represented the United States during several F.I.S. Congresses: 1951 in Venice, Italy, 1953 in Igls, Austria, 1955 in Montreux, Switzerland and 1957 in Dubrovnik, Yugoslavia. Thanks to aerial and ski-trip surveys sponsored by Corty Hill, the area developers of California, Nevada and Oregon had access to concise and expertly compiled snow and terrain reports. In 1946, Corty along with world-famous skimeisters, Luggi Foeger and Hannes Schneider, financed surveys from which came reports on possible ski area developments – ranging upward from San Gorgonio in Southern California to Mt. Bachelor in Oregon. This was in cooperation with the United States Forest Service which sent along its expert, James Gibson. Corty Hill was cited by the Helms Athletic Foundation’s Hall of Fame as “consistently and unselfishly a guiding light, a source of enthusiasm and support for American skiing for many years”. He was also a Class “A” racer, his competitive career included: entry in two Harriman Cups, the nationals of 1940 and two Silver Belts in California’s Sugar Bowl. Cortlandt T. Hill was elected to the U.S. National Ski Hall of Fame in 1970. If you notice any errors or inconsistencies in Cortlandt T. Hill's bio, click here to let us know.